We’re really happy about the Beta 2 release and are now working on the last batch of improvements we want to land for 1.0. The team is very close to landing the re-vamped transitions and pushState branches and we’re actively fixing lots of bugs as we go. We’re happy to see that jQuery Mobile has been nominated for for two .Net awards – the annual Awards are organised by .net magazine – the world’s bestselling magazine for web designers. The categories are Innovation of the Year & Open Source App of the Year! We’d love your support by voting for jQuery Mobile. The documentation for lists has been updated to add this feature. Thanks to project707 for all the hard work on this feature and the helpful input of jeffholmes. Added a simple filterCallback in the listview options to delegate complex search logic to end users. This allows you to drop in any search pattern matching logic needed without adding too much complexity to the core filtering code. Fix for Split Button List dialog having no background and weird line from background image. Thanks jgable! Brought back the page content div theme inheritance from b1 (issue 2221) Thanks to abdulqadir for the suggestion. Fix nested waiting-for-dom for initializePage. Using dom-ready within dom-ready meant that initializePage went to the end ofthe queue. That brought problems when other dom-ready code expected jQM to beset up, capable of changing pages and so on. But because $.mobile.pageContaineris also set in initializePage, changePage and others didn’t work. Thanks moll! Fixed an error in the array reference that was causing support tests to not test properties as they should. 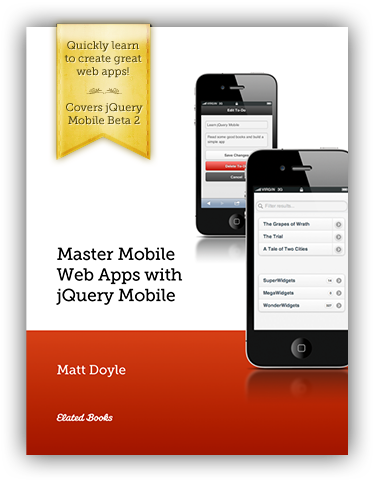 Matt Doyle recently released a new book on jQuery Mobile called “Master Mobile Web Apps with jQuery Mobile“. It’s very detailed 300+ page eBook in PDF format that is well-written and updated to reflect the latest Beta 2 release. Matt will be updating the book when we hit 1.0 and offer a free update for people who buy the book now. We’d like to thank Jive Software for contributing the time and expertise of their developer, Ghislain Seguin, to the core jQuery Mobile team. Ghislain has been a tremendous help over the last three months and we wanted to recognize the generous donation that Jive Software has made to this project. Jive Software is a software company from Palo Alto that has an enterprise social networking platform that allows companies to engage employees, customers, and the social web. If you are looking to support the jQuery Mobile project, we are actively looking for corporate sponsors to provide donations or commit to long-term developer involvement. To learn more, please contact Todd Parker, project lead to discuss opportunities for supporting the project and open source. If you want to a quick preview of our latest progress, visit www.jquerymobile.com/test. This is a live demo of the docs synced live to the jQuery Mobile GitHub repo. This is helpful to check before filing an issue in the tracker to see if we've already fixed a bug you see in the last stable release. Please keep in mind that this the unstable, development version so we don't recommend linking to the latest in a production site or app, but it's great for development and testing. When someone creates software like this, where there’s a solution for such a diverse variety of browsers. You deserve nothing but the best. Hope you guys win that price! Nice improvement into mobile jquery. Keep it up grow.